Long-awaited genocide trials of Khmer Rouge leaders in Cambodia have moved a step closer with the arrival of UN officials to put the process in motion. UN trials head Michelle Lee is setting up an office in Cambodia, her full-time base from January. She will work together with a Cambodian team to seek justice for the estimated 1.7 million people who died under the Pol Pot regime from 1975 to 1979. A short list of potential judges and prosecutors is being drawn up. Head of the Cambodian team, Sean Visoth, told a joint news conference with Ms Lee that the short list would be announced at the end of December. Ms Lee said the start of the legal process is now clearly in sight. "We have been working very hard in this process and we are very hopeful that we will be on the ground operating by either the end of January or the beginning of February," she said. "We are even more hopeful that the Cambodian people will see this as progress toward achieving the justice which is really long overdue." 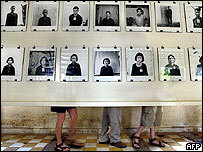 The head of the regime, Pol Pot, died in 1998. But there are likely to be a number of trials for the surviving former Khmer Rouge leaders, says the BBC's Guy De Launey in Phnom Penh. There will be an investigative stage that could last up to 18 months, before court proceedings - which could last up to three years - get under way. The Cambodian government still has to raise more than $10m to meet its share of the cost of the trial, which is being mainly funded by the UN. Phnom Penh has appealed to international donors for help to meet the cost.